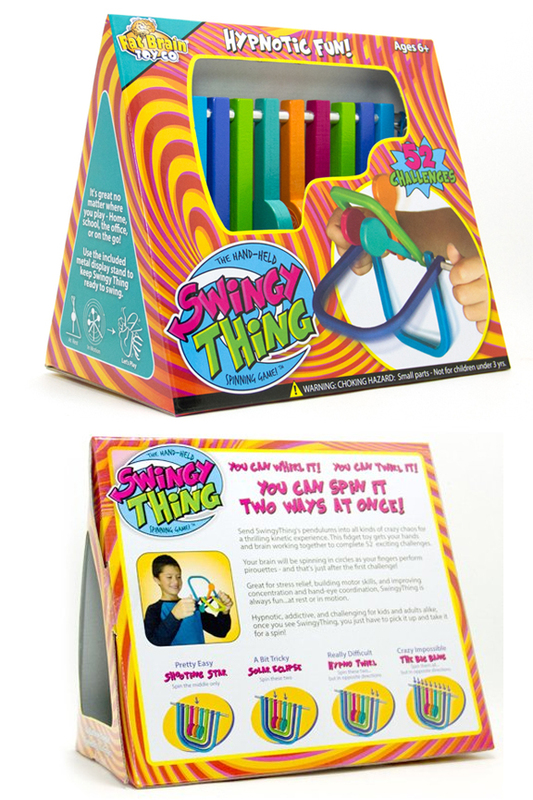 With a look that encourages interaction, and game play that's action packed, SwingyThing makes the perfect addition to any toy shelf. It's incredible fun for kids of all ages, and it can be challenging enough to captivate adults as well. Once you pick it up, it will be tough to put back down because the pieces start twirling around immediately. There are six pendulums in all, and each rotates easily, and independently from the others. You can spin them in either direction, and you can even get two pieces to spin in opposite directions at the same time. A simple movement will begin the game, but incredible concentration, and ample practice will be required to win it. 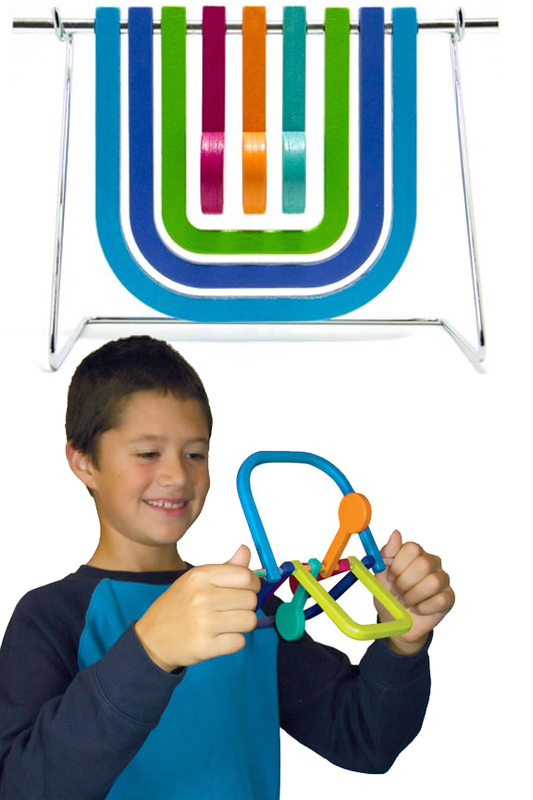 The set includes a metal stand to display the toy, and a color poster that provides as many as 98 challenges to master. It's designed for children 6 and up, but people of all ages will find it addicting and enjoyable. Take it with you on your next road trip, stick one on your desk at work, pack it to kill time in a waiting room, or keep one around the house for independent play that doesn't involve screens or batteries. Top quality materials ensure that it will last for years, and simple operation ensures that anyone can use it. Because it requires focus it helps children improve concentration, and because the brain is forced to work in tandem with fidgety fingers, it also helps to improve hand-eye coordination and fine motor skills. As relaxing as it is fun, this unique toy also helps to reduce stress because it's hard to not have fun while holding it. A toy, a game and a conversation piece all in one, this thing will be a hit no matter where it ends up. This simple, yet addictive toy looks attractive when at rest, and includes everything you need for hours of mind bending fun. 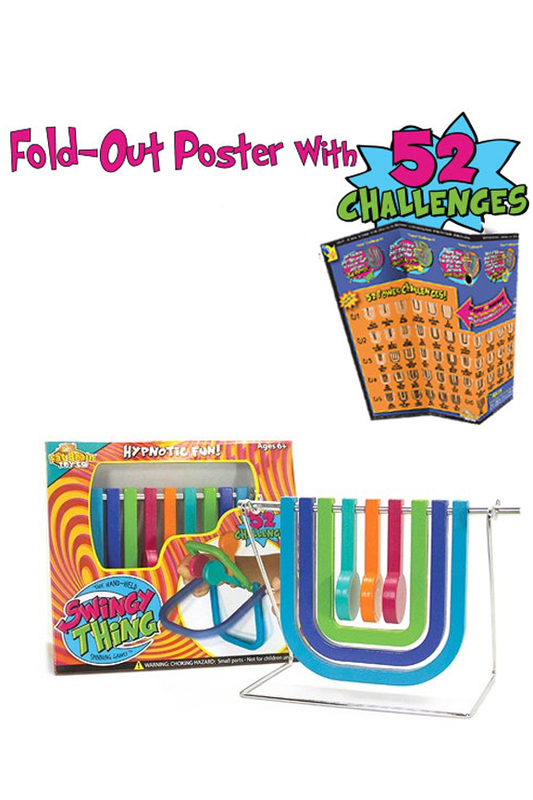 (1) Fold Out Poster With 52 Challenges. Simple. The simplistic design looks great when sitting still, and it comes alive as soon as you pick it up. You'll be amazed at the amount of fun that's packed into a seemingly basic package. No lights, no sounds, no batteries and no cables, just good wholesome fun that no one will want to put down. Easy To Use. Getting the pieces to move is easy. Children of any skill level will enjoy the hypnotic movement, and with practice, anyone can master the technique to improve skill over time. Just pick it up, and you're already playing. Challenging. Although it's easy to get started, the difficulty can range from incredibly easy to totally impossible depending on which pieces you try to move. Begin with more simple combinations, or one at a time, then move up to spinning several flippers and dippers at once. High Quality. Forget about cheap plastic or flimsy materials that break with repeated use. This toy is made from wood and metal to guarantee years of enjoyment. As an added bonus, it has a quality look and feel that improves the overall value. Addicting The bold shapes and vibrant colors draw you in, and the non stop excitement prevents you from putting it down. Once you start twirling the colorful pieces, you won't want to stop. With each challenge you master, there will be another one waiting to test your skills. The effortless game play will have you moving from one challenge to the next as you try to dominate all 52. Solo. Most games are for multiple players, but this one is designed for a single user. Perfect for quiet time alone, long trips in the car, waiting rooms and more. Use on a solo mission, or get together with friends to challenge each other. Versatile. Not just for one age group or gender, this game appeals to boys and girls alike, and it's even fun for parents and other grown ups too. Educational. Get brains, eyes and hands all working together to build fine motor skills and improve concentration. This fun game will exercise the brain, and relieve stress as it provides endless hours of enjoyment. Just looking at it makes you want to pick it up, and once in hand, the pieces begin to twirl and sway instantly. Essentially there are two types of spinning parts; flippers and dippers. You'll find three flippers at the center, and three dippers surrounding them. With practice, anyone can learn to isolate movement in order to pinpoint certain flippers and dippers. Spin them around just to watch them move, or work through specific challenges to move certain pieces while others remain stationary. To play, hold with two hands. One on each side, gripping the metal rod. To get the flippers spinning, move the toy in an up and down motion. 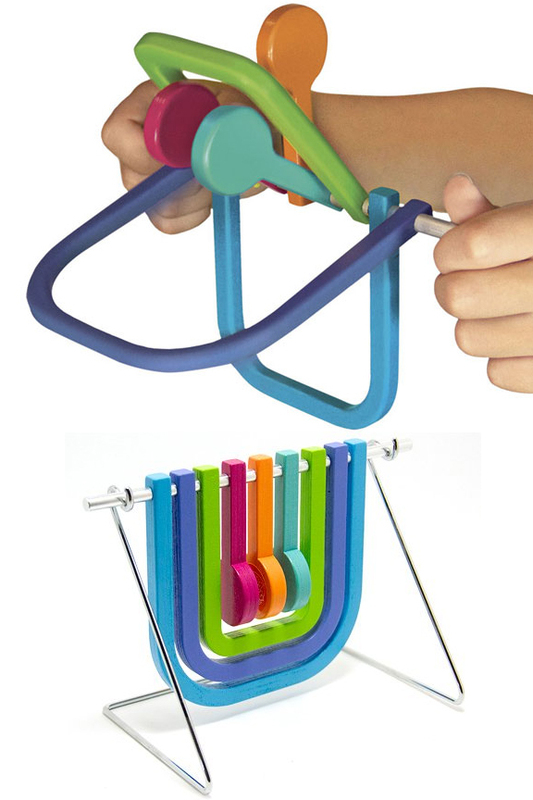 To get the dippers spinning, move the toy in a back and forth motion. Use the included poster to master 52 different challenges. After finishing the main 52, go back to the ones with a slam and try to spin pieces in opposite directions for up to 98 different challenges. The set will include a variety of power challenges for the user to master. Below is a sample of what you will find. What to do: Spin the middle flipper only. What to do: Spin the two outer flippers. What to do: Spin the two largest dippers, but spin them each in opposite directions. What to do: Spin all flippers and dippers, and spin them in opposite directions. Dimensions 8.8" x 5.8" x 7"
Uses Kill time, amuse yourself, develop fine motor skills, improve concentration and more. This fun, one-person game can be whimsical or challenging based on the users skill level. Spin and stall flippers and dippers to have fun or meet certain challenges. Each piece can move independently, and in both directions. Color Multiple: blue, violet, green, magenta, orange and teal. Material High quality wood and metal construction. Stand Included Yes. Metal display and storage rack included. Challenges Included Yes. Fold out poster with 52 challenges and added tips. Pieces 6 Spinning pendulums in all. Three dippers on the outside, and three flippers on the inside. Warnings CHOKING HAZARD: Small parts - not for children under 3. More fun that anyone should have with themselves, this addicting game is exciting and challenging for users of all ages. It makes the perfect office toy, a great road trip accessory, the ideal waiting room time waster, and a fun brain exerciser. Just pick it up to begin to play, but be careful because you won't want to put it down. Order Yours Today! I "get the idea" but I have no motivation or desire to play with it. It just does not appeal to me. Having said that, I think some people will like it, and to is well made.